Here in the Philippines, summer means time for halo-halo, mais con yelo, banana con yelo, sherbet, slurpee and dirty ice cream. Traditionally, our bodies crave for this sweet refreshment every time we feel the intense heat of the sun. That’s why when my Singapore days would fall on summertime, I’d usually go out to spot a Wall’s umbrella to buy a dollar-worth of peppermint choc chip ice cream bar, sandwiched between two wafer biscuits. But in case I fail to find one, that means I have to go to the nearest hawker or food junction and order a bowl of Ice Kacang. 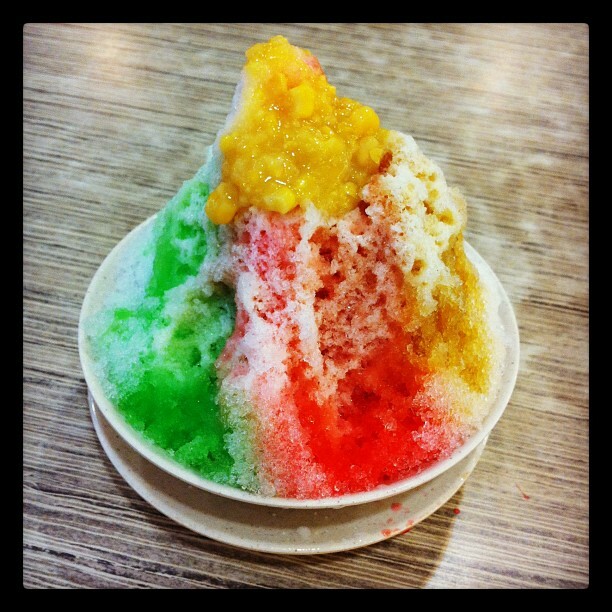 The way I’d put it, ice kacang is Halo-halo in SG. Normally, it costs a few cents more than a Wall’s ice cream bar (about $ 1.20) and you can easily spot them on desserts section of almost every food junction in SG. Though ice kacang or ais kacang originally came from Malaysia, it is also a common dessert, a favorite I guess, in Singapore. Ice kacangs are flavored snow cones in bowls that come with different ingredients at the bottom, poured with milk at the top… much like a halo-halo nga. They usually come in distinguished multi-colored syrup which, for me makes it ‘happy to eat’. 🙂 The shaved ice they serve used to be hand cranked like most halo-halos here in Pinas but nowadays, most ice kacang vendors use motorized or special ice machine for crushing. Most stores serving this dessert offers other varieties of crushed ice combinations–with ice cream, durian, lychee, etc. As for the ice kacang you see above, it’s the last I’ve tasted before I got back in the Philippines. It’s a regular order–multi-colored shaved ice (resulting from different syrups, red rose syrup, sarsi syrup and another syrup I don’t know but sweet) with black gulaman or cubes of agar agar, red mongo beans, nata de coco, kaong or nipa palm fruit, topped with milk and sweet corn. What can you say? Pindutin ito para bawiin ang tugon.